This fight landed on the Queen’s Birthday which is a big day out here in Thailand. 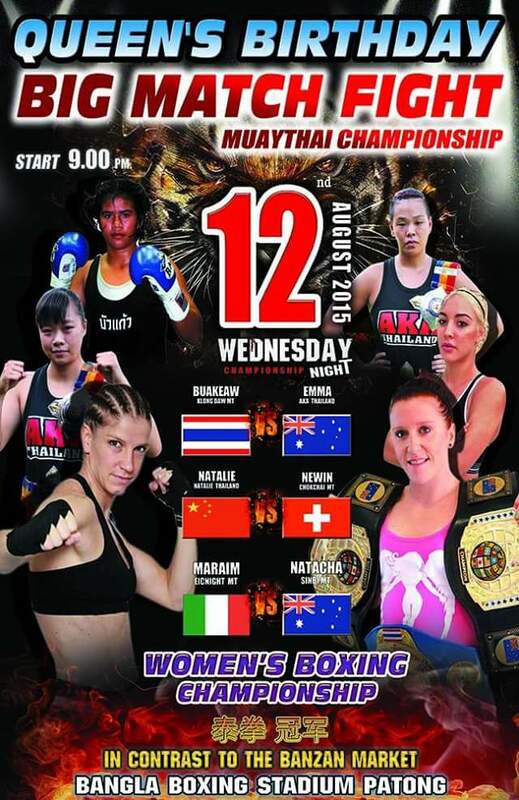 Lots of Muay Thai shows across Thailand, particularly showcasing female talent. Originally I was supposed to fight in Chang Rai for my first world title shot however due to WMC sanction rules which we did not know were in play, I was unable to fight on this show. It was a devastating time for me as I was still on a losing streak and took only a day off after my previous fight to come back to cut weight and train for this title shot. I was focused, despite my last loss, and I knew that I went down on a very close scorecard against an extremely tough opponent. Nevertheless I was fighting, and I was focused. Bitterly disappointed by the outcome of the Chang Rai show, I was excited when a rematch with Buakaew (current WBC World Champion) was arranged for me. We trained for Buakaew and how to beat her – it was not outside the realm of possibility that I could beat this girl. When we arrived at the stadium, we noticed that my opponent had been switched. Due to a lot of injuries and shows swapping fighters, a lot of match ups were changed last minute. It didn’t affect me at all though. It was explained to me that Nung Ning had just fought and lost to the Petsilung, the girl I had just fought and lost too so it was actually an appropriate, well thought out match up. Thailand – you never stop surprising me! 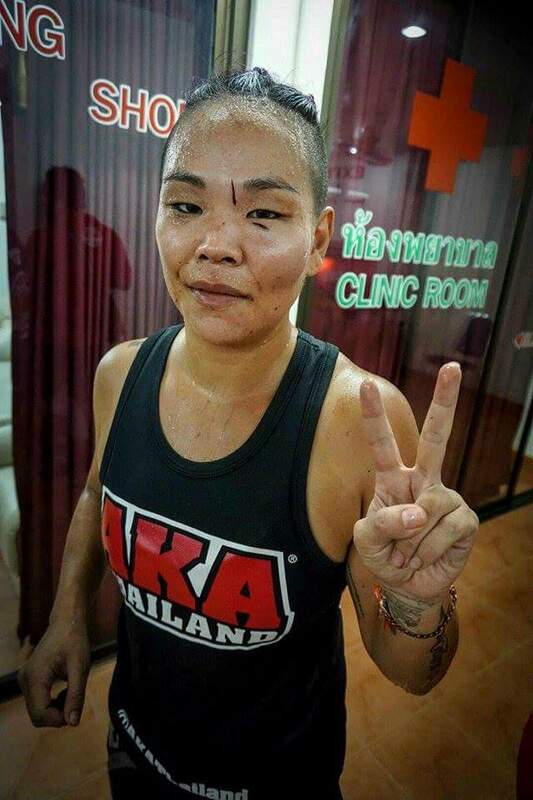 Nung Ning is a young, well established fighter here in Phuket and her loss before this fight was the first loss in many fights for her. Round 1 started out in typical Thai style fashion. Lots of feeling out with a few aggressive teeps from Nung Ning. After checking her first kick I could feel how strong her kicks were and knew we were in for a good fight. I also noticed Nung Ning using her hands which really excited me. 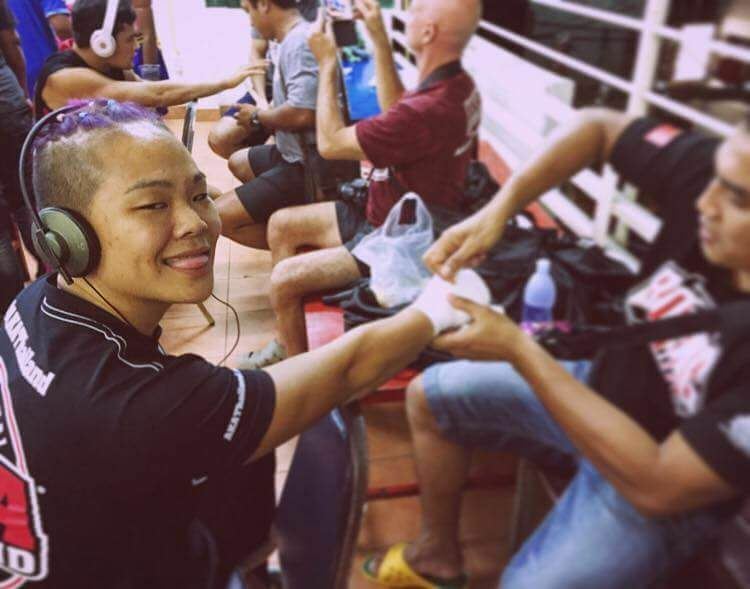 Thai’s don’t typically train boxing, but I feel that after many match ups against foreigners, Nung Ning had taken the time to learn a thing or two. The first round remains reasonably relaxed and my corner as happy upon my return. The pace of round two picks up quickly with a lot of kicking exchanges. We are on an even playing field and I am looking for the edge. After spending a lot of time working new things in the clinch, I see the opportunity to grab Nung Ning and start to work. We have some back and forward exchanges in the clinch and we proceed to work into the ropes. I manage to turn Nung Ning into the corner, release my left arm, and come through with an elbow. Nung Ning goes down for an 8 count. I have to say how impressed I was that she got back up. She really had to dig deep to continue on so respect to her for that! Nung Ning comes back with fire and she is looking to kill. It was my own fault – but in the moments after, I knew, I had started an elbow war. As the third round starts, we quickly move back into the clinch. I feel strong here and manage to lock Nung Ning’s head down. I am struggling to hold her where I want her and she begins to blindly throw elbows. Some are landing, some are not, but nothing to hurt me or force me to give up my position. My left cheek begins to swell a little as the round continues and Nung Ning throws an up elbow which cuts me inside my eye brow. I feel the paper cut sensation, but know it’s not bad. My corner is going mental, yelling at me to continue to push forward. Nung Ning comes out of the gate in round 4 with a tonne of elbows. The swelling on my left cheek is quite significant by this stage so I do my best to tie her up in the clinch. My cheek starts to bleed but the corner is still giving me the thumbs up to continue doing what I’m doing. I am doing my best to protect the left side of my face but unfortunately it’s beginning to affect my vision and Nung Ning is beginning to out strike me. The referee calls a time out to have the doctor check on me and my heart sinks. I don’t think the cuts are bad enough to have the fight stopped, but I felt that way the first time I got stopped. I walked over to the doctor and said to him clearly “mai mee jeb – hen dai – hen dai! Mai bpen rai!”. (I don’t have any pain, I can see – I can see! No problem!). The doctor wipes off my face and allows me to continue. The bell sounds and I return to my corner. I am being told I have won and my corner instructs me not to fight in the fifth round. The instructions are for me to control the ring. I’m a little fatigued, but mostly concerned about getting cut again and am being told to stand still and teep. Nung Ning fires and I automatically attempt to counter – my corner is yelling at me to stop. We continue on and Nung Ning is pushing forward. I look to my corner and they are all giving me the signal to keep controlling the ring. In the second half of the round the corner instructs me to stop fighting completely. At about the same time, Nung Ning believes she has won and also stops fighting. We both look at our corners and mine says I’ve won – her’s says she hasn’t and she needs to keep fighting. After a long time on the losing end, I was stoked to get back on the board. 10 stitches later I was on my way! It’s really bizzare writing about this fight so long after the fact. And after transitioning to a new style of Muay Thai, I am actually really disgusted by my performance in this fight. I went on to rematch Nung Ning 6 weeks later and had a really dominate victory over her. No cuts in the second fight!